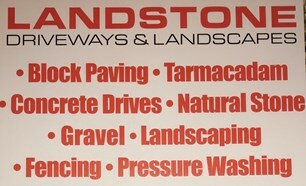 Landstone Driveways & Landscapes - Driveways/Patios/Paths based in Stourport-on-Severn, Worcestershire. Our driveways come in hundreds of options and we strive to get the best design, texture and couler to add value and complement your property for years to come. Or, we create to your design including just as many decorative borders so the options are endless. Sounds expensive? No, we will aim to save you money! All work is covered by a 5 year garuntee, free quotations and free friendly advice. Feel welcome to browse our website or call us for more information.